Head to the east (for one mile) when leaving the Cancun airport. Look for highway #307, the only highway running north and south from Cancun to Tulum (actually it continues down through the State leading eventually to the Belize boarder). Turn south (right) on #307 and travel for 65 miles (about 100 kilometers) to the bays of Akumal. Fifteen miles south into the drive, you will pass the pueblo of Puerto Morelos with gas stations and several `topes` across the hwy. A tope is a bump that will slow down or stop traffic. It is a good idea to keep your heads up at all times for these little buggers as they can tear off your muffler or transmission if you are moving along to fast. They will all have signs right next to them and some warnings, but the paint on these bumps are usually warn off so they are very hard to see. Next you will pass ….the fastest growing city in the Americas… Playa Del Carmen. It is 20 miles south of Puerto Morelos with more gas stations. Travel straight and you will ascend on a bridge and drive over the sprawling city of Playa Del Carmen If you want to stop at a larger grocery store, drive to the south end of the city and follow our direction to Soriana Mall (almost directly across from Sam’s Club). Then continue south 12 miles more miles you will pass the golfing community of Puerto Aventuras (with two more gas stations, one on each side of the road). Be careful of the topes on the hwy. near the people crossing bridge. 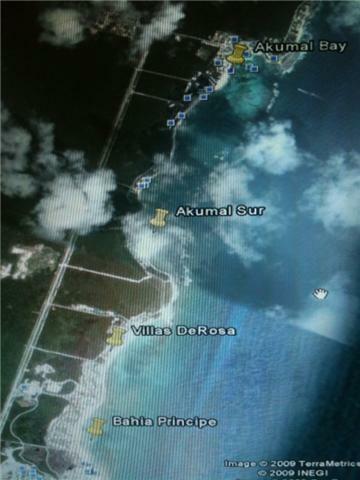 Finally the last 12 miles will be Akumal. The first Akumal exit you will see is "Playa Akumal" we are located 2 miles further south at the exit at Aventuras Akumal. 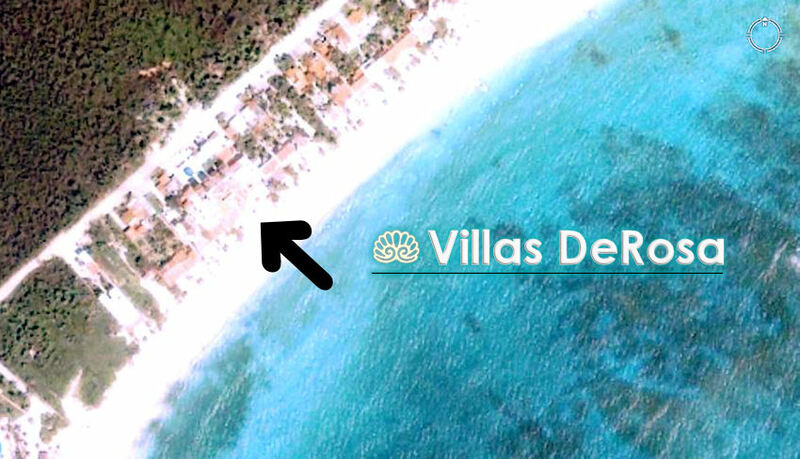 At this exit, you will see a green road sign above the road that will say ‘Villas DeRosa Resort’. This exit is to your left and you will see the name Aventuras Akumal in pink letters on the blue entrance wall. You must pass our entrance as you will not be able to exit across the hwy. median. Drive south passed the Bahia Principe entrance with flagpoles on the left and a huge arch way with water fountain on the right. Travel a short distance more to just before the walkway bridge of Bahia Principe where you will find a hwy. turn area called a “returno”. Stay in the left lane and make the U turn and head back to the north. The first exit passed Bahia Principe is Aventuras Akumal.